Chris Crooks' two-part denizen of the deep adds a dramatic statement to green spaces. Like the Great White that terrorized a certain beach community, this land-bound beast brings ferocious adventure to life. Chris Crooks' two-part denizen of the deep adds a dramatic statement to green spaces as it leaps through waves of grass, inspiring mock terror from all who cross its path. Crooks handcuts each monstrous piece from metal that is aged with a bright rust patina. 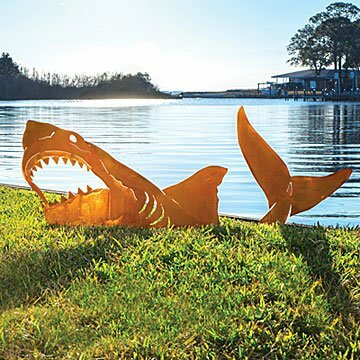 He then bends and shapes the teeth, gills, and other shark-like details, giving the piece added bite and making it “fins down, the best land shark ever!” (Thanks, Connery Ranch from Bethesda, Maryland). The steel segments are equipped with mounting brackets that attach to 6-inch lawn stakes (included). Handmade in Tucson, Arizona. I have the sea serpent/dragon by our large pond and that one survived over a week buried under two feet of snow! So when my son's birthday was near we purchased the shark. It is just as cool and beautiful as our other sculpture. We have not installed it yet, but it will go on the grassy bank above our pool. I grew up with SNL and Jaws maybe this was more for me! This brought a smile to our friend's face! It looks great in the backyard garden. All her neighbors are jealous! Nice shark, ridiculous anchoring design. I'm pleased with the way this looks, but the anchoring stakes are grossly inadequate. The so-called "6" lawn stakes are actually just 6" (60 D) common nails. (These are not meant for ground contact, by the way.) The nails go through channels along the bottom of the shark (which is in two segments) and into the ground, but one of the channels in unusable because the shark flipper above it is bent (designed that way, it appears) and blocks access to the channel. Furthermore, because the shark is a tall, flat, lightweight sheet of metal, it presents a large surface for the wind to topple. Mine did just that, even though I built up some soil around the bottom of the piece. I am going to have to devise a more sensible support for this thing, or maybe put a large rock behind it to hold it up (not an attractive solution). This item should come with two-prong anchor stakes, or be designed with a flanged footing. As it is, it's way too flimsy. This baby lives up to expectations. Looks absolutely hilarious in the yard! I'm buying one for 3 more people at Christmas! It "swims" around the yard. Great bit of whimspey for the yard. Easy to order, not too heavy to ship, looks great in our back yard. Real conversation starter. A real conversation piece. Love that it is hand crafted. We put it in our backyard , next to another metal shark figure. We added a Narragansett beer can in it's teeth, to make it more like Jaws.